On topic "cascading more than one 4017", I found this from an Old Motorla Cmos Data Book. Something cool that can be done is to use 2 4017: one wired forward and one wired reversed to play the sequence backwards, and allow 3 modes: forward, reverse, and a K2000 effect (pendullum)..
so did anyone ever make a pcb layout or stripboard for the 4017 8 step sequencer? also is there a way to run this or somthing similaR off 9v? I actually did a PCB (still working on it) but it's for the CD4022-powered 8 step Sequencer (the Vanishing Point). correct me i'm wrong but the 4017 and the 4022 are the same chips pin for pin? if so i could use your layout. i already have some 4017s, i just want to do acouple small sequencer projects with them(add a wsg and toy keyboard, and maybe another standalone possibly 16 steps for other small circuits). i am really just trying to brush up on sequencer knowledge cause i just ordered klee pcbs!!!!! 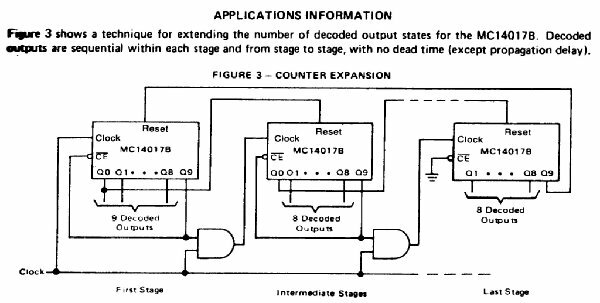 Actually the 4017 is a 10 output decoder and the 4022 a 8 output decoder.. So if you want to make a really simple 8 step sequencer, but therefore not being able to extend it to more than 8 steps, you should use a 4022. Reset is made automatically after reaching the last step..
About the pin configuration, the datasheet is the same and I know that the 4022 has some NC pins..
My layout is made for a Zvex Seek pedal, so the circuit is very tiny, and it is double-sided..
Daniel who started this thread, and is a moderator here, well I haven't seen him around since June last year. I hope he is okay? i also noticed that dnny disapeared half way through the pages of this thread? hope all is well, i will check back in a week or so when im done experimenting with what im workin on. I tought there was a topic about a sequenser for the wsg. I can't find it anymore. well if you find one post the link cause i am interested!!! i did find this just now is this what you are talking about? No. But that's also interesting. Forum-member lalito asked about it. Hi there, I'm fine. I'm Great. I had few troubles whit time... you know how work and GF´s can be that was the main reason I dropped out. This week a friend told that there is a great Lunetta forum here, and i must say that looks really nice. good to see that everyting else is just like it was when I left. so dnny glad to see you back here!!! i have actually read this complete thread atleast 3 times!!! and i have breadboarded the baby 10 and yours and tried so many dif variations, but i still only get either all the leds to light up or just the first one? i did have it so that when i put a clock in from an astable 555 to have the leds dimm and then bright. is there a way to breadboard this without pots and just have resistors? im just getting fustrated and i want to get it working so i canintergrate it with my wsg... any help appreciated? I put a comparator on the clock input and used a potentiometer voltage divider for the reference voltage. Now I can clock my Baby10 from all the VCO's and LFO's in my synth. I used an LM358 for the comparator so I could use only gnd and +ve. It's probably easier than using the gate to trigger circuit. would you by chance have a schematic of that circuit? Something like this... I used a 100k trimmer for the resistor. I put a 100k resistor on the input. I used an LM358 but if you want to use a TL072 then I think you should change the Vdd to go to -15v and add a diode on the output. Since the LM358 is a dual device, you could duplicate the circuit and connect it to the output from the sequencer pots. If you put the 100k potentiometer on the front panel you could get an extra gate output that is on when the sequence is above a certain value. Im an electronic semi-newby. I have successfully put together a few projects, including the SL, from MFOS. I put this sequencer together and things seem to be wired correctly but the power supply seems to be buggy. For instance when i turn the adjustment pots to their extreme the rest of the circuit looses power. Hi guys, is there likely to be a stripboard layout of this, with perhaps a current component list? I would like to have a go at this myself, but can't find any mac software to convert the schematic to stripboard. If anyone knows a Mac version of lochmaster, I'd love to know about it. Otherwise, if someone could run this through on their PC version for us stripboard freaks, it would be appreciated by many, I'm sure! Also, I'm presuming this design works with the 1V/oct version of Soundlab? If anyone knows a Mac version of lochmaster, I'd love to know about it. Otherwise, if someone could run this through on their PC version for us stripboard freaks, it would be appreciated by many, I'm sure! I use the java version of DIY layout creator from Storm Software. It's freeware and works like a charm on my mac. 2. What is the NPN transistor?